Good news for all LinuxMCE users and Z_Wave funs. 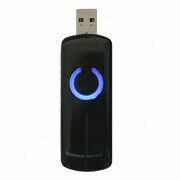 Another Z-Wave USB dongle has been confirmed as working with the latest Z-Wave driver (4.27 from October 2008). The MCV Z-Wave Dongle supports all the new command classes, and supports both high speed (4x 40kbps) and standard speed Z-Wave devices. It’s available for US and Europe Z-Wave frequencies and it’s just $65. Moreover, there is a lot of other Z-Wave devices on the MiCasaVerde online shop suitable for Europe and company offers worldwide shipping by very reasonable price. For example, shipping to Cyprus of MCV Z-Wave Dongle will cost just $24. Not bad at all!